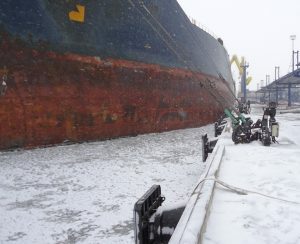 We are able to install the Quick Release Mooring Hooks in conditions with temperatures below zero degree Celsius, even down to -50 °C (-58 °F). Materials behave differently at room temperatures (and higher) compared to subzero temperatures. Cold and stressful environments require special adaptation of the design of the Quick Release Hook and the implementation of special materials. The accumulation of dust, coal and iron ore particles at bulk terminals can cause the quick release mechanism to fail. 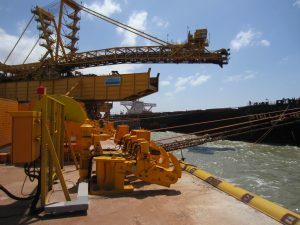 Mampaey Offshore Industries has however designed Quick Release Hooks specifically to be installed and operated in coal and iron ore quays with protection covers for the internal mechanism. Do you want to ensure and increase safety on existing jetties? We provide iMoor integrated mooring systems. • Freestanding capstans, suitable to be installed onto existing anchor bolt configurations. 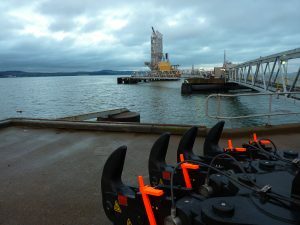 • A Mooring Load Monitoring System installation for already installed Quick Release Mooring Hooks. • Special adapted hooks for installation onto existing assemblies. • Quick Release Mooring Hook Units specially designed with integral capstans to fit existing anchor bolt configurations.